Mavin queen and Mama J, Tiwa Savage, was earlier called out on Twitter for once again stating her position where the issue of feminism is concerned but this time, she went further to state that female artistes don’t get as much pay or rather, don’t charge as much as their male counterpart in the Nigerian music industry which is what this post will briefly talk about. According to @GbemmyG who reported the statement on Twitter, Tiwa stated that she cannot charge as much as Wizkid in a show and that is not fair on them especially since they put in the same amount of work. Let’s get something straight here, it’s good to want equal pay, that is what everyone should want, what shouldn’t be thought of is attributing her low pay to gender especially when compared an artiste like Wizkid. 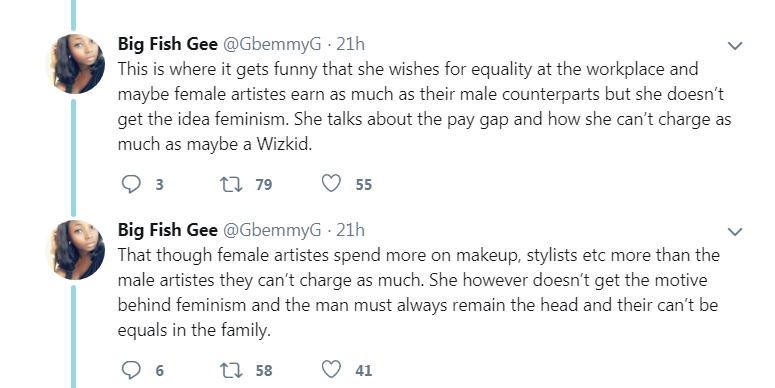 Judging from the information reported on Tiwa’s speech, the truth is, she can’t charge as much as Wizkid because of Starpower and not gender… which is why it looks like @GbemmyG came for her on Twitter because that is what we’ve seen most feminists do. Supporting Godwin Adeola on Twitter, this is more of Starpower than gender because Wizkid pulls more crowd, has more hits than Tiwa, has more collaborations than Tiwa, is presently penetrating different industries than Tiwa is doing and making international collaborations and endorsements than Tiwa Savage, so what are we saying? I think we can bring up gender if a B list male artiste gets paid higher than an A-list female artiste just because they’re of different sexes but that is not the issue here. An artiste like Wizkid is huge and will always get more pay than an artiste that doesn’t pull as much weight. Next is Tiwa Savage wanting equal pay with an artiste like Wizkid because she has to make up and look pretty before performance. I don’t think that should be a criterion for a high pay. I want to believe makeup and stylist comes with the territory and not every female artiste will demand same, but what should be fair is that female artistes be provided with what makes them comfortable with their looks for the performance, but that “time” to get that comfort shouldn’t also be paid for, I mean, I want to believe stylists and makeup artists are on the organizer’s budget and not the artiste’s and if it’s on the artiste’s budget then that should be revisited. Hey Buddy!, I found this information for you: "Tiwa Thinks Gender Affects Her Pay As An Artiste … You Think?". Here is the website link: https://360kwado.com/tiwa-thinks-gender-affects-her-pay-as-an-artiste-you-think/. Thank you.